I love myself a good crusting buttercream on a cupcake. On first bite, I love the little crunch of the frosting that gives way to a creamy, heavenly frosting goodness. I’ve always made crusting buttercream with butter, but since I’ve been working on minimizing dairy in my diet, I decided to play around with a vegan frosting that had the same taste and texture. The result is this beautiful vegan vanilla frosting that has all of those amazing characteristics, and that isn’t too sweet. I ate so much vegan vanilla frosting yesterday, that I gave myself a stomach ache (…I am seeing a pattern here, because I’ve said this more than once!). This vegan vanilla frosting also pipes really well, as you will see in the photos below of a two-toned buttercream I made to top my vegan chocolate cupcakes. If you are looking for an easy, delicious, and pipeable vegan vanilla frosting, then you are in the right place! 🙂 And for those of you that aren’t vegan, you make this a traditional crusted buttercream by substituting the butter in for the butter alternative. The differentiating factor between buttercream and frosting, is that buttercream uses butter whereas frosting does not. Consequently, buttercream will always have an ivory coloring to it whereas frosting will be perfectly white, which might be desired in certain decorating situations. 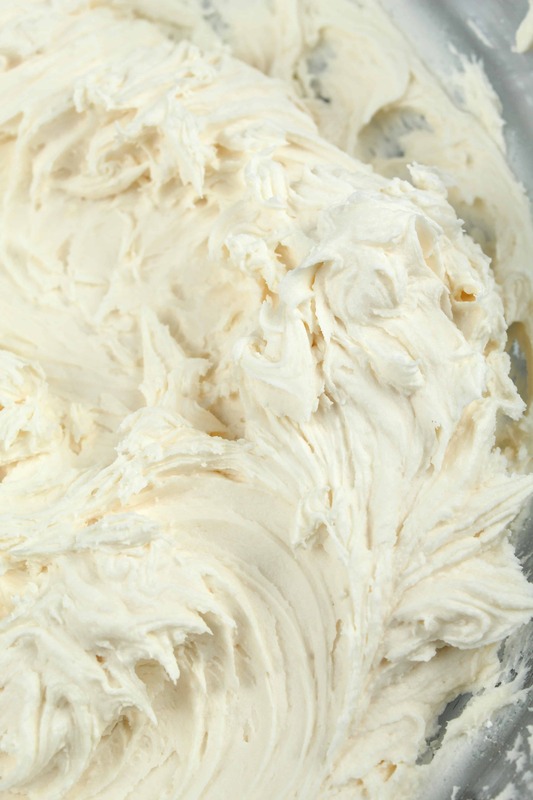 The fat base of buttercream is 100% butter whereas frosting is 100% vegetable shortening. However, whenever I make a non-vegan buttercream, I use 50% butter and 50% vegetable shortening. The interplay between these two, yields a smooth and silky buttercream coated with a little bit of a crust from the shortening. 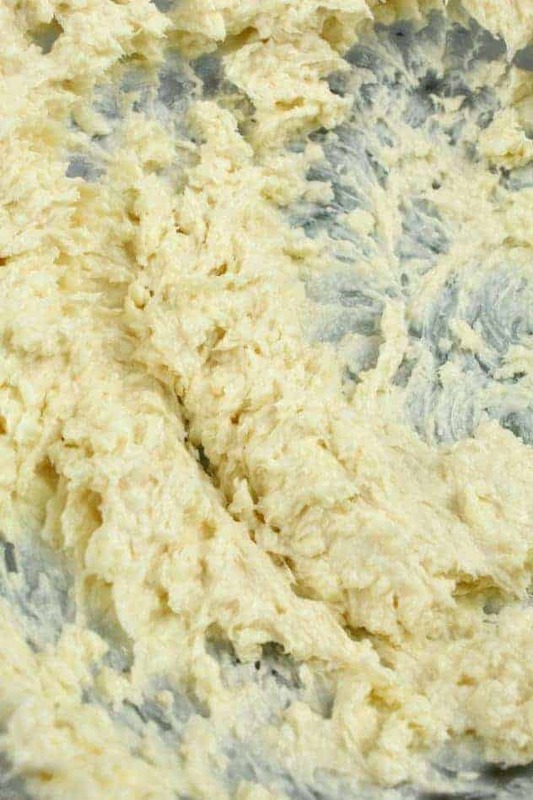 This type of buttercream is more commonly referred to as a “crusting” buttercream. The butter is also kept in there for flavor. 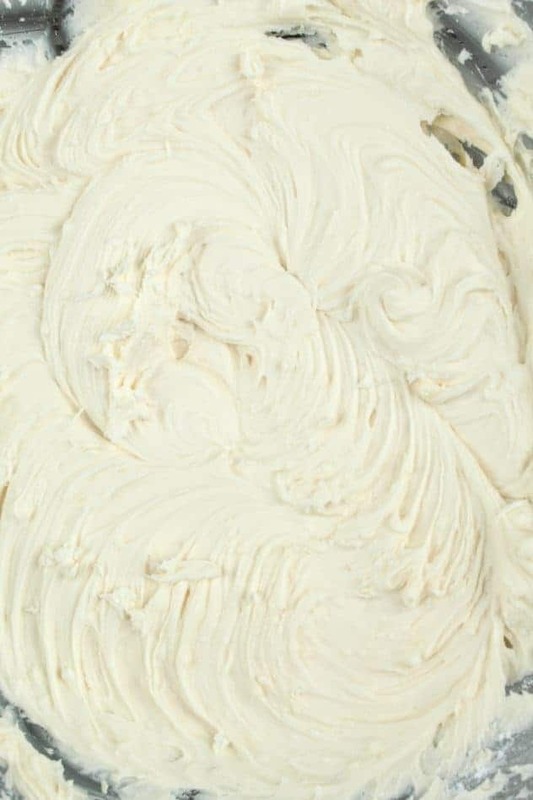 So, because a vegan buttercream technically does not use butter derived from cow’s milk, it is really a frosting. What can I substitute for butter in buttercream? 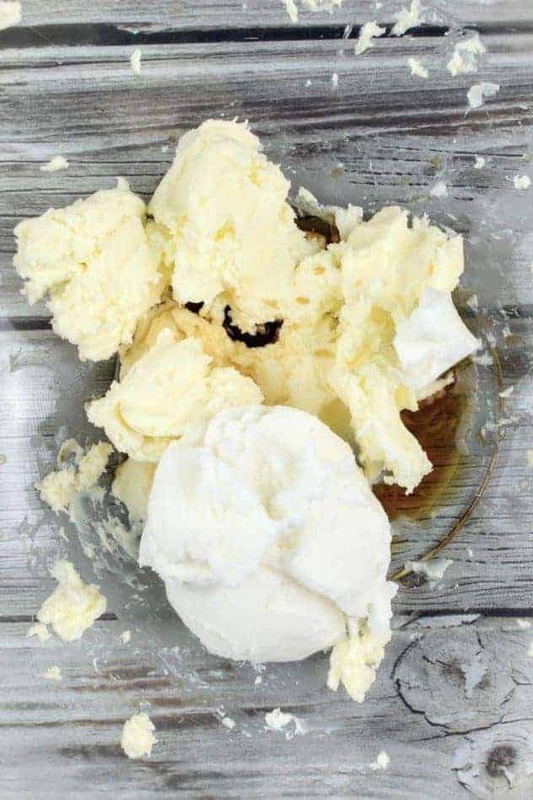 You can always substitute butter alternatives or shortening for the butter in buttercream (which then technically becomes a frosting). You might want to consider adding in butter flavoring though to enhance the flavor profile. How do I thicken my frosting? You can thicken your frosting by adding in more confectioner’s sugar. How do I thin my frosting? To thin your frosting, add in a tablespoon of milk of your choice and mix it in. Continue this until the frosting reaches the desired consistency. 1. Add vegan butter, shortening, and vanilla extract to a large glass mixing bowl. Using an electric mixer, mix on medium speed until everything is creamed together. Make sure your butter is softened, but not melted. To soften the butter, I like to leave it out on the counter overnight. For people that live in cold climates, you might have to squish the butter between your hands while it is still in its wrapper. I do this before unwrapping it and putting it in the bowl. 2. Add confectioner’s sugar, one cup at a time and mixing with an electric mixer on low-medium speed after each addition. After the second cup of confectioner’s sugar, I added in 1 tablespoon of milk to thin the frosting out before adding more sugar. After each addition of sugar, when you go to mix it you will notice that at first the frosting will look chunky. Keep mixing, and it will smooth out. After the last sugar addition, I like to turn the mixer on high for a minute to really whip the frosting. 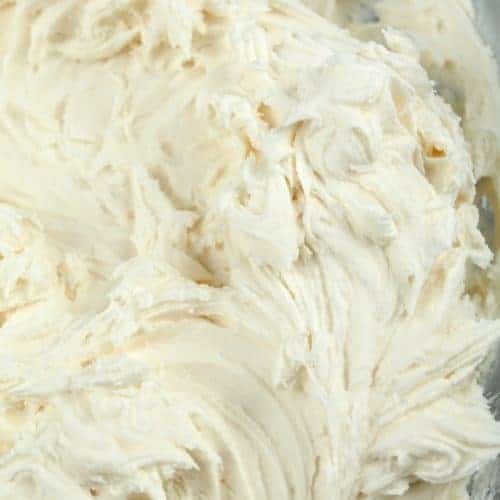 Vegan vanilla frosting after mixing in one cup of confectioner’s sugar. Vegan vanilla frosting after mixing in two cups of confectioner’s sugar. 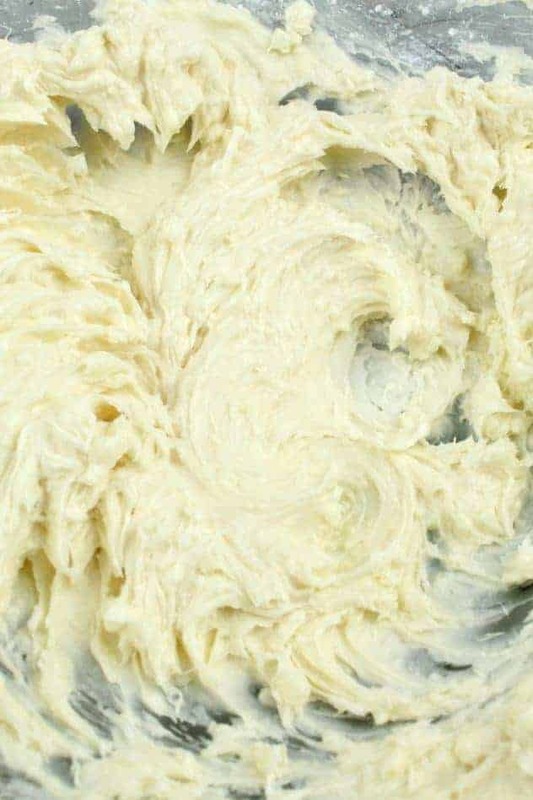 Vegan vanilla frosting after mixing in three cups of confectioner’s sugar. 2. Measure out one cup of frosting and place in a separate bowl. Using either liquid, gel, or powder food coloring, dye the buttercream to desired color. NOTE: When using liquid food coloring, be mindful of the consistency. If it starts to thin out, add a little confectioner’s sugar (a tablespoon at a time) to thicken it back up. You also want to make sure you don’t use so much food coloring that the taste is altered. Also, when trying to achieve a pure black or red coloring, it’s best to consult google on this. These two colors are actually difficult to achieve, and special directions need to be followed :). 3. Fold the top part of the piping bag inside out (first inch or two) and use a straight metal spatula to coat the inside of the bag with a thin layer of colored frosting. 4. 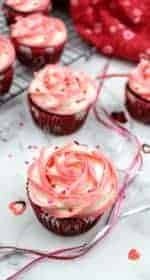 Stand the bag upright in a tall drinking glass or mason jar, and add the white frosting to the center of the piping bag with a spoon or rubber spatula. Then lift the piping bag out of the glass and gently shake it vertically to settle the white frosting down into the bag (see video below). 5. Once you are ready to pipe, twist the end of the bag so that the frosting doesn’t fly out the back end when you go to frost the cupcakes. Then do a practice squeeze onto a plate until you see a two-toned frosting emerge. To squeeze out the frosting, keep the end twisted with your dominant hand and apply a light pressure to the piping bag. Use your other hand to guide the piping bag as you decorate. 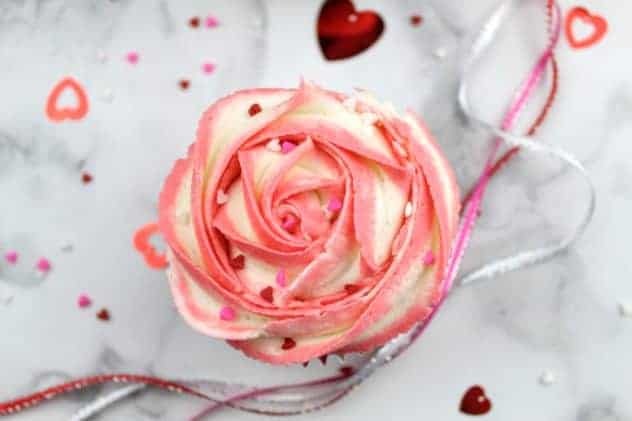 To create a rose pattern, start in the center of the cupcake and slowly swirl your way to the outside of the cupcake. Most of the steps described above are shown nicely in the short tutorial below by Rosie. The only difference between the video and my directions are how to set up the two-toned frosting inside the piping bag. I tried Rosie’s way but found it difficult. It looks easier to coat with a spatula so that the center remains clear to put in the white frosting. 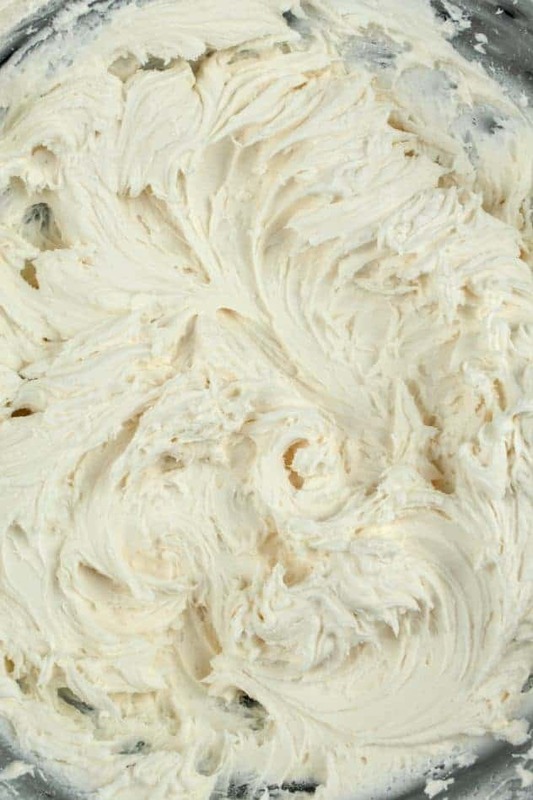 This vegan vanilla frosting is great for decorating cupcakes and for using on cakes! I like to pair vanilla frosting with vanilla, chocolate, and carrot cupcakes. Add vegan butter, shortening, and vanilla extract to a large glass mixing bowl. Using an electric mixer, mix on medium speed until everything is creamed together. Add confectioner's sugar, one cup at a time and mixing with an electric mixer on medium speed after each addition. After the second cup of confectioner's sugar, I added in 1 tablespoon of milk to thin the frosting out before adding more sugar. 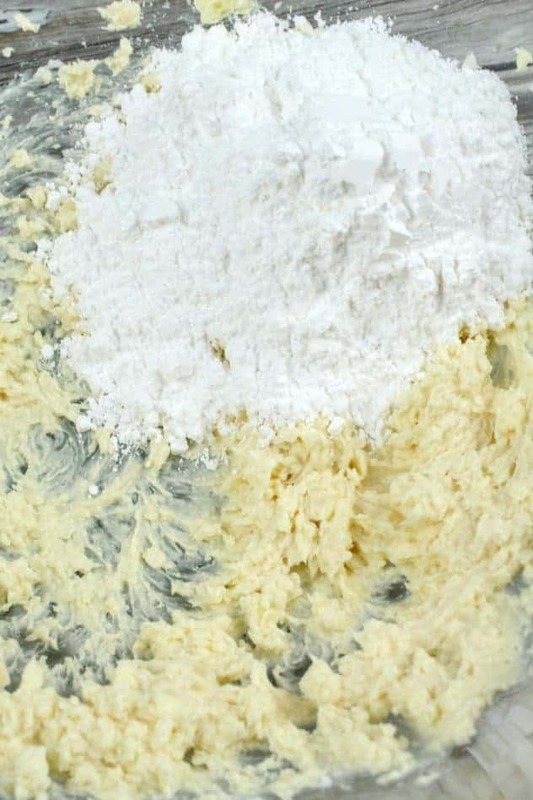 After all of the sugar is added, whip the frosting by mixing at high speed for about a minute. Use it to frost cupcakes or cakes. If you are not going to use it right away, you can store it in the refrigerator for 1-2 weeks. Let it warm up to room temperature though before frosting cupcakes or a cake with it. I calculated the calories on a per tablespoon basis to make tracking calories easier when using the frosting for cupcakes. A swirl on a cupcake uses about 3 tablespoons of frosting. Wow Vegan Vanilla Frosting perfect for the kids looks yummy very healthy I love it. Wow, that’ how I like my recipe, simple and delicious. I can’t wait to try this one. I love vegan vanilla frosting too!!! But I just find it too tedious to make, although I haven’t really attempted at making one, haha. Oh my gosh wow that look amazing. I’ll have to have a go at that soon, haven’t tried any Vegan baking yet. This looks amazing, I can’t wait to try it. I have started baking more and love finding good recipes! Wow! This looks so delicious! I love this vegan recipe. Even if I am not vegan, I have friends and family who are, and it is sometimes difficult to think of things to make when I host a small party for them. This recipe is just perfect! Thank you! Those cupcakes were just perfect for Valentine’s! I love cakes that have such beautiful frosting…and vanilla can be such a yummy ingredient for cakes indeed.